Eco-friendly is no longer a mere trend or another fancy term in the way we do business or attract customers. Instead, over time, the term has gradually evolved into a necessity, a standard and ethic way to conduct business practices and often at a lower cost to the alternative. Here are some simple steps that even a small business can easily adapt to. 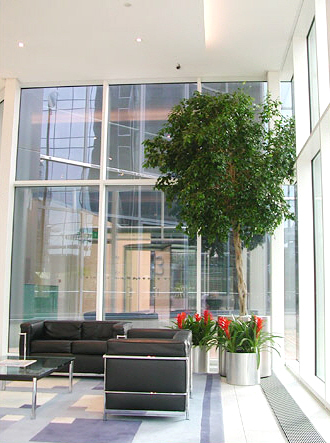 Becoming an environmentally conscious entity is no longer a tough task! Discard the old heavy paper filing and printing habit, it's time to ask our computers for help! You can also manage file archives, sharing and saving documents electronically. It not only saves trees, but also your expenses. 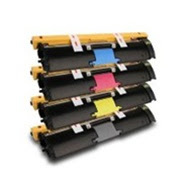 For all things that still need paper, how about using recycled printing materials and remanufactured toner cartridges? 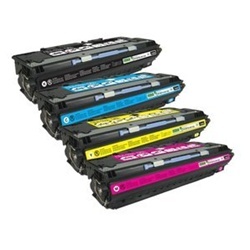 By choosing to use a remanufactured inkjet or toner cartridge, one can contribute to one less plastic cartridge is needed to be molded. We can help preserving our environment by reducing the oil needed to mold the plastic container and reduce the landfill space needed to dispose of the used plastic containers. And here at Toner Spot, we are also taking the initiative to contribute to this positive movement. We are currently designing a recycling program that is easy and provide a monetary incentive for our customers to recycle their empty cartridges. Come visit us soon for this exciting upcoming program! Thanks to our advanced technology, conferences and presentation can now be conducted via internet. Companies are encouraged to travel less mainly due to the case of reducing costs. However, it also helps the environment when less transportation is being taken. 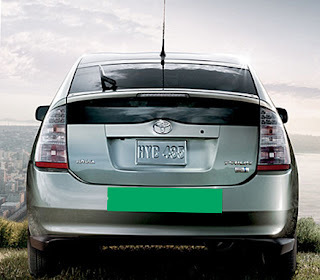 If traveling is unavoidable, companies can now choose another route by traveling "green." Even back in 2009, when National Business Travel Association conducted a survey with manager-level workers who are in charge of travel planning, 21% agreed that it is essential in selecting an environmentally-conscious company. Remember the number was only 16% from 2008 survey. To name a few travel "green" options: Select hotels that perform energy efficient practices, using public transportation, and cooperating with rental services who offer fuel efficient cars. Don't get nervous here, we're not talking about tearing off the ceiling and knocking down the walls. Let's start with something small, something even a caveman high school student can do. C. Implement programmable thermostats and set less extreme temperatures. Ever feel that chill when walking into an office space in the “summer” time? D. Place green plants because it helps in recycling the air. After all, we all want a bit of freshness especially sitting behind the cubicle or office for long periods of time, right? All the above things are definitely not hard to achieve. Motivate yourself, and motivate your employees. Help us pushing this green movement and making our Earth a even better place to live! 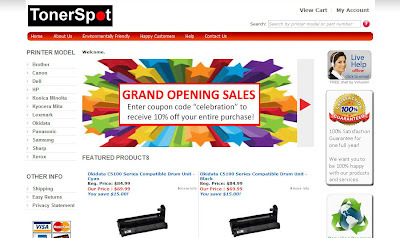 Thanks to our dedicated team members, here we have it, our official website at http://www.toner-spot.com/!! 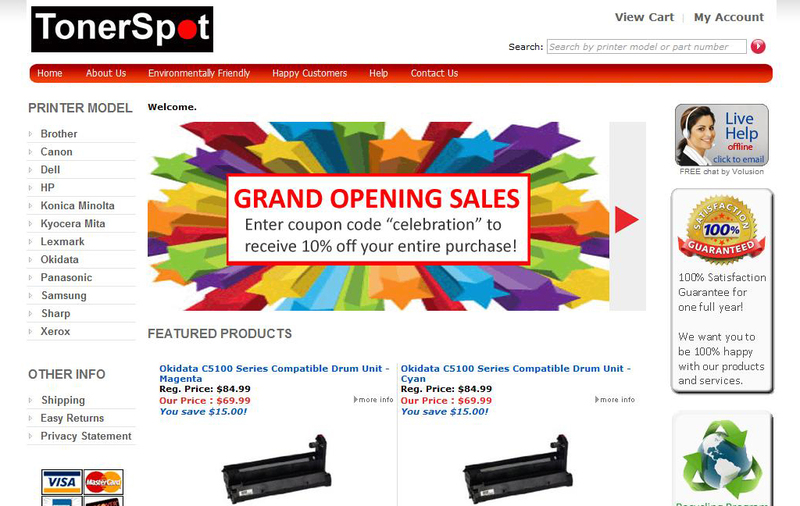 This is our first official website providing affordable printing solutions, which include remanufactured and compatible toner cartridges. 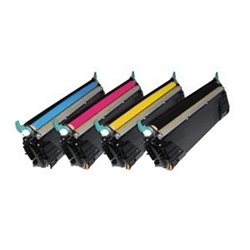 No more paying loads of $$$ for expensive toners! Much love was put into this baby. Who knew constructing a website can be such a hassle. Our initial idea was simply drag and clicks a few buttons, and then a beautiful site will be waving happily in front of our screens. Well, as least that's what the advertisements presented from all the major hosting companies. Sincere thanks to our team members and our friends. And of course, our hosting technician support who always patiently answer endless html-101 questions. Toner-Spot will definitely grow stronger this year and continue striving for top-notch customer services and top quality products.